In November 2017, your Kareo Clinical account will be upgraded to the latest version. This month, four new features are launching as part of Kareo's effort to achieve 2015 edition certification. This will help ensure our customers' financial success because providers that use 2015 edition certified technology have the ability to pursue up to +/-4% Medicare reimbursement adjustment in 2017 and +/-5% Medicare reimbursement adjustment in 2018. In an effort to provide our customers with a secure technology platform that passes or exceeds government regulations, Kareo has added a new Emergency Access feature. This new emergency access privilege allows practice administrators to give members of their practice temporary admin permissions in the event of an emergency. Now customers have greater control over platform access and can self manage without the need to contact Kareo Support. How to Grant Emergency Access? Select an individual within the practice you would like to grant access to. Edit that individual's user profile, and click the checkbox for "Allow emergency access for Your Practice Location". Then Save User. That individual will now be able to request emergency access in the event that it is necessary. How to Request Use of Emergency Access? When a practice member is assigned Emergency Access by an administrator, a new Emergency Access link will appear under Practice Settings in the left menu. Click the Request Emergency Access button and provide a reason, which will be stored in the Audit Log. The Username and Password will appear. Copy both the Username and Password, and Log in to User Management. The User Management Page lists individuals who already have the System Administrator role, and allows additional users to be assigned the System Administrator role by clicking the checkbox next to their name and then Save Changes. Once changes are saved, sign out of the Kareo platform so that changes can take effect. Then log back in. Note: Once logged in to Kareo, individuals with the newly assigned System Administrator role should double check all their user roles to ensure original roles are still marked (Biller, Office Staff, etc.). The Immunization Registry allows a provider to maintain a more accurate patient chart with a patient's immunization history from the state registry. These feature enhancements were made to enable providers to request, access, and display a patient's evaluated immunization history and the immunization forecast from an immunization registry. Once enrolled, the provider will be able to send and receive immunization history from the state registry. Providers who administer vaccines (including flu shots), and would like to meet the optional immunization reporting measure for the purpose of Meaningful Use. Call your CSC to request enrollment. How to Retrieve Immunization History? Immunization history can be obtained by clicking the Retrieve Immunization History button on the patient's chart or from a clinical note. The Registry Portal window will open. 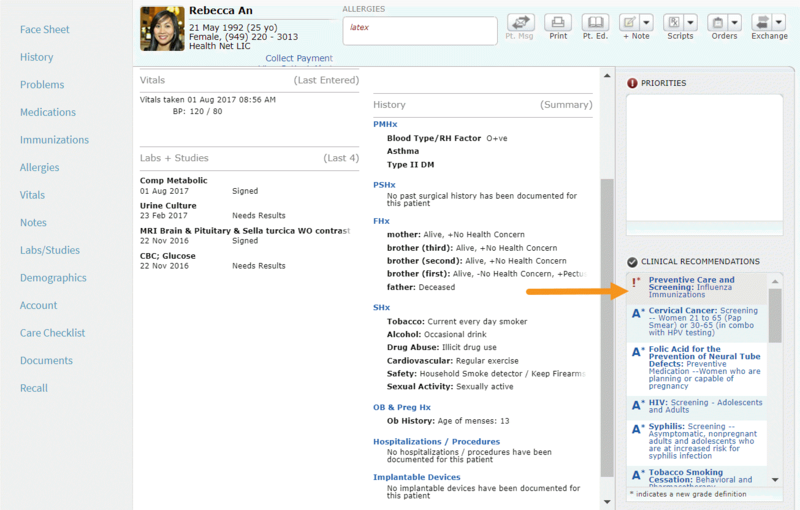 Once logged in to the portal, a patient can be searched for using criteria such as Patient Name and DOB, and the patient's immunization history can be entered into Kareo using the Add Historical Vaccine screen. 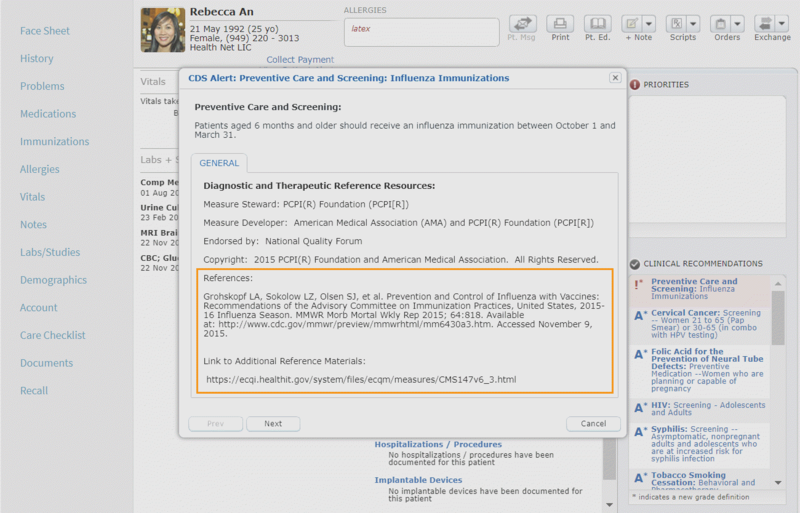 Kareo has added a total of 8 new Clinical Decision Support (CDS) interventions! The new interventions can be found in the patient's FaceSheet and are indicated with pink highlighting at the top of the clinical references pane. The new interventions added are based on the quality measures used for MIPS Quality Reporting and will trigger an alert when criteria of the intervention have not been met. The Provider can view reference resources and additional reference materials with one click of the mouse and receive guidance on patient care. Example: The patient in this scenario is showing an alert that they are due for a flu shot. From the patient FaceSheet, navigate to the clinical recommendations pane, click the recommendation to view the list of references and the URL address for additional reference materials. Note: The link information provided can be copied and pasted into the URL address bar of any web browser. 3. Additional language options with ability to favorite. 4. 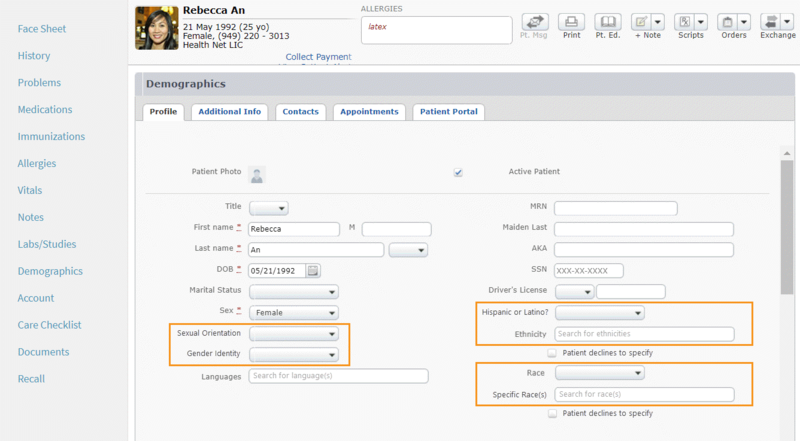 A new indication field for patients of Hispanic or Latino descent and the ability to multi-select specific ethnicities. 5. Additional race options with ability to favorite. Navigate to the patient record in the Kareo Platform > Demographics > Profile Tab > click Edit to view the updated demographic information options. Fixed an issue where users could not view the Patient List report. Fixed an issue where users were unable to add a new service location. This could potentially cause issues in keeping accurate records, maintaining office efficiency and scheduling appointments.